All serious North American birders eventually end up in Southern California. This is not due to Hollywood, Disneyland, or Malibu beaches. The vast, varied topography that is Southern California has recorded over 555 naturally occurring bird species, many of which are near endemics to its geography. Each of Southern California's many habitats offers its own specialties, and this guide will help you to find them all. Sooner or later, dedicated birders must come to Southern California. The birding routes, with instructions and exact mileages between suggested stops, guide resident and visiting birders to hundreds of birding sites. New to this edition are chapters covering Kern River Valley, the rugged Clark Mountain wilderness, south-eastern California's Blythe region, Sespe Condor Sanctuary, coastal Ventura County, and birding hot spots in suburban San Fernando Valley. All chapters from earlier editions and their locations have been revisited by the author and/or local bird authorities to test current conditions and confirm or revise birding information for accuracy. The maps, bar-graphs, and Specialties section all have been up-dated to ensure that the reader has effective tools at hand for contemporary birding. 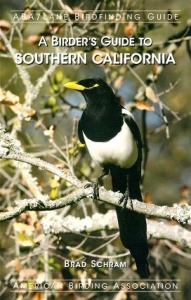 Brad Schram brings over 40 years of local birding expertise to this 5th edition of A Birder's Guide to Southern California. He and the devoted California birders who helped explain their local birding turf have created a birdfinding guide which will help you figure out where to go, when to go, and what you'll see when you get there. 432 pages.